IN addition to the KFA container flats pictured opposite, February saw Revolution Trains make significant progress with several more of its under development models. In ‘N’ gauge, tooling work has commenced on the Class 92 while manufacture of the Class 390 ‘Pendolino’ is now underway at the Rapido Trains factory in China. The latter models are expected to be delivered during the summer but with some 10,000 individual vehicles to make and decorate, a more specific date is not yet available. Also in 2mm, the model of the 35t GLW Class B tankers is to go ahead following a late surge in orders that allowed the minimum order threshold to be achieved. 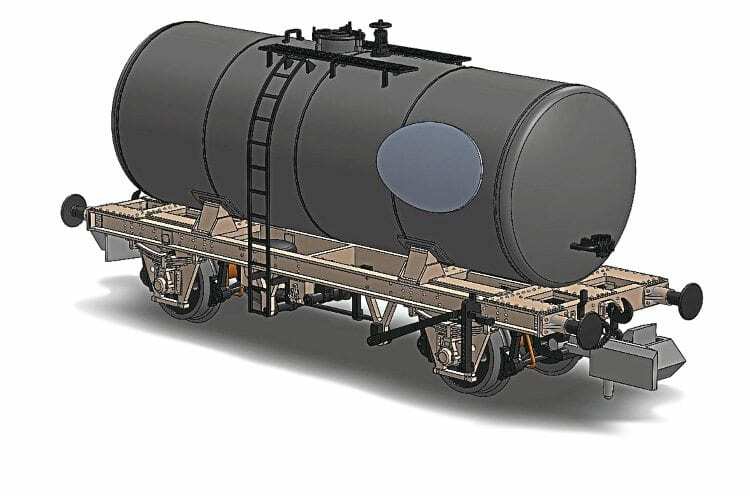 With CAD work (below) already completed, tooling of the two-axle tankers is now underway. The models, all still available to pre-order, will cater for the variation in suspension design with a range of liveries on offer. Read more Modelling news in April’s issue of RE _ out now!